- Mile 106: The bridge across the Lackawaxen River is closed to vehicle traffic, but you can dismount and walk your bike past the construction sign. The start/finish is at the Weisel Hostel. There is a parking lot at the hostel, halfway down a long driveway between the house and the road on the right. Don't park in the few spots right next to the house -- these are reserved for the house parents and event personnel. Your RBA will be there Friday night for the start. As usual, breakfast items, including hot oatmeal will be available one hour before the start. indicate male/female usage). When you are ready to leave, strip the sheets off your bed and place them in the hamper on the second floor landing. While 90% of the roads are in good enough shape, 9% are in pretty rough condition, and the remaining 1% are in appalling shape. After two pretty rough winters in a row, the untreated cracks from last year have now become gaping potholes and craters this year -- if you hit one of these at speed, it will most certainly ruin your day. Unfortunately, this is especially true for just about all the roads in Bucks County, where you will be riding in the dark at the start and as you later return to the overnight controle. Some of the bigger hazards have been highlighted on the cuesheet, but you should be on the look-out for potholes at all times, and keep a safe distance while riding in a group so you can safely maneuver around these hazards. Day 1 is a ~400k loop through the Delaware Water Gap and points north that returns you back to the hostel for the overnight controle, where volunteers Bill O. and Guy H. will be taking care of you. Food will be available when you arrive and depart along with dormitory bunks for you to rest. Day 2 is a 200k out-and-back segment through French Creek and into the Lancaster valley. There is a 200k brevet starting on Sunday that runs concurrently with the 600k's day two 200k The 200k brevet mileage is indicated in parentheses in the notes below. 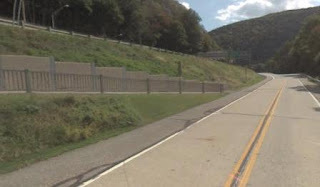 - Mile 59 and 187 Controle 2 and 6: You will be passing through Water Gap twice on day one. The controles listed are the Bakery and Diner, respectively, but you may use either one you like. There are also two nearby mini-marts and a pizzeria you may use as well for a controle stop. Those of you passing through later in the evening may find the diner closed in which case the pizzeria is your best bet. - Mile 137: One of the high-lights on day one is Hawk's Nest; as noted on the cuesheet, there are scenic vistas you can stop at to take a good look. - Mile 143 Controle 5: The Port Jervis Diner is the listed controle but you may instead use the mini-mart on the opposite corner. You will be facing on-coming traffic as you go across the bridge walkway. - Mile 230: As previously mentioned, the roads in Bucks county are in terrible shape, and as noted on the cuesheet, Gallows Hill Rd is pretty rough with many big potholes. Most of you will be passing through here in the dark and you should be extra careful on the many little rollers you will encounter. - Mile 235: As noted on the cuesheet, you will encounter a wooden bridge with uneven surface. And as indicated on the cuesheet, you should dismount and walk across this bridge to avoid a mishap. - Mile 270 (26) Controle 9 (2): You will be stopping at a 24-hr mini-mart but this is an untimed information controle. This will allow any 600k riders who get a late start after the overnight controle a bit more time to catch up on the time limit. - Mile 296/316 (52/71) Morgantown: You will be passing through Morgantown twice. There are many restaurants, fast food and mini-marts available for you to replenish your supplies. There are limited services available in the next 20 miles as you head out into the Lancaster valley. - Mile 306 (62) Blue Ball Controle: This is another information controle located at a restaurant that will probably be closed for most of you. There is a mini-mart across the street if you need to replenish your supplies, but as noted above, you have many more options in Morgantown for food.